malasay.com :: View topic - Is Yemen Chewing Itself to Death? malasay.com Forum Index » News, Current Affairs and Headlines » Is Yemen Chewing Itself to Death? By 4 in the afternoon, most men walking the streets of Sana'a are high, or about to get high � not on any sort of manufactured narcotics, but on khat, a shrub whose young leaves contain a compound with effects similar to those of amphetamines. Khat is popular in many countries of the Arabian peninsula and the Horn of Africa, but in Yemen it's a full-blown national addiction. As much as 90% of men and 1 in 4 women in Yemen are estimated to chew the leaves, storing a wad in one cheek as the khat slowly breaks down into the saliva and enters the bloodstream. The newcomer to Yemen's ancient capital can't miss the spectacle of almost an entire adult population presenting cheeks bulging with cud, leaving behind green confetti of discarded leaves and branches. 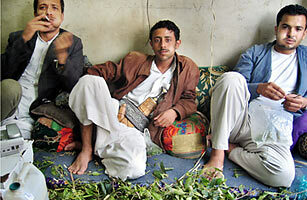 For its many devotees, khat is a social lubricant on a par with coffee or alcohol in the West. Indeed, because chewing the leaf isn't forbidden by Islam, "khat is alcohol for Muslims," says Yahya Amma, the head merchant at the Agriculture Suq, one of the largest khat markets in the city. "You can chew it and still go to prayers." The leaf's energy-boosting and hunger-numbing properties help university students focus on their homework, allows underpaid laborers to work without meals and, according to local lore, offers the same help to impotent men that Westerners seek in Viagra. Evening khat ceremonies � regular salon gatherings (usually only of men) to chew and chat about matters great and small � are the country's basic form of socializing. The plant thrives in the high hill country outside Sana'a, where nearly every patch of irrigated land is covered in khat. Unlike coffee, which Yemenis claim was first cultivated here, khat is easy to grow and harvest. And though cultivating and dealing the leaf doesn't generate the kind of instant wealth associated with growing poppies in Afghanistan or coca in Colombia, it certainly provides a steadier income than growing vegetables does � that's why nearly all of the country's arable land is devoted to khat. And khat needs a lot of water, which is scarce in Yemen. Khat fields are typically flooded twice a month, consuming about 30% of the country's water � most of which is pumped from underground aquifers filled thousands of years ago, and replenished only very slowly by the occasional rainfall that seeps through the layers of soil and rock. A recent explosion of khat cultivation has drawn water levels down to the point where they are no longer being replenished. The option of pumping desalinated water over long pipelines from coastal plants is too expensive for such a poor country. 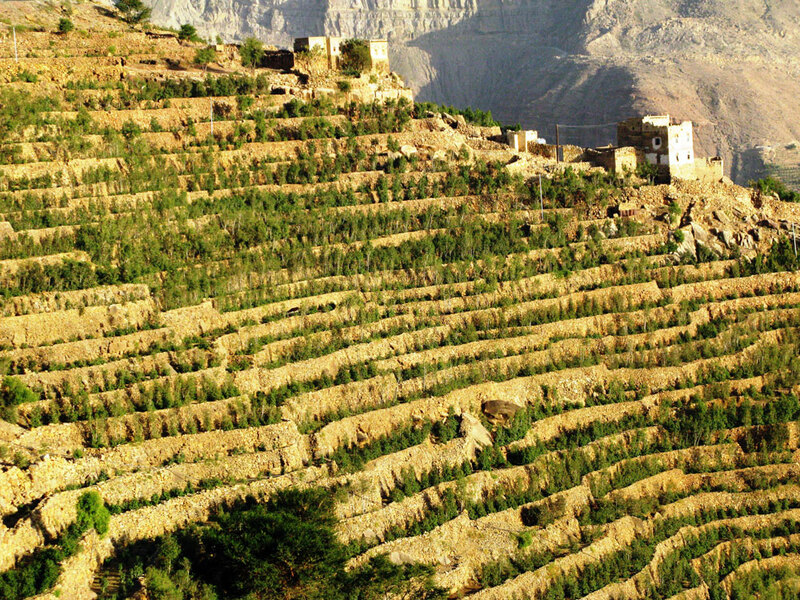 Yemen is in real danger of becoming the world's first country to run out of water. A massive drought � accelerated by khat cultivation � and the resultant population displacement could have a devastating impact in one of the most fragile countries in the Middle East. A separatist insurgency in the south is threatening to break the country apart, while pirates from Somalia are menacing the coast. Al-Qaeda, meanwhile, has long seen the lawless tribal lands in the northern mountains as a potential sanctuary. Quitting khat would double the amount of household water available, says Klingler, but that may only slow the onset of crisis. The hydrologist argues that Yemen needs to revert to consuming only as much water as it collects from rains � and to import most of its food from abroad. Yemeni women gather around a water well south of San'a, the Yemeni capital, on May 15. The poor, war-stricken country is suffering from yet another disaster � water shortages that will only worsen as limited underground supplies run out. "We are in crisis. And this is expected. � We are using almost 100 percent more than the annual renewable water that's available in San'a," Eryani says.